Greetings. Today, I felt called to draw another card from the Halloween Oracle deck. 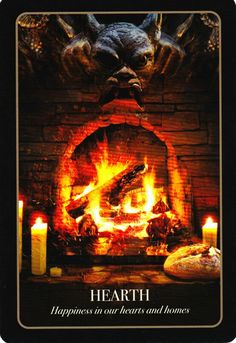 It is “Hearth,” which indicates a focus on home, family, and the magic of well-being that those things bring. If you are lacking in those areas, it may be time to pay a bit more attention to beautifying your life. If you have a fulfilling home / family, then it may be useful to give thanks for those things and recenter yourself in the security and peace that they provide. There are sorcerers who will help you and sorcerers who will harm you. But, strangely enough, in a world that doesn’t believe in anything but physics and money, magic takes uncanny and subtle forms. With that in mind, the deadliest sorcerers of all are not those who wear robes and cast spells. Rather, they are those who work with the darkest, most powerful metaphors of this age: money, cynicism, doubt, fear, and bigotry. Tolkien lived through a time when the rise of modernity had brought forth extremely efficient ways of exterminating or enslaving large groups of people. And his Middle Earth fairy tales gave the West a new mythology, a new language through which hope and goodness could be expressed—since the ancient metaphors of troth, right action, and maat had been largely forgotten or corrupted over time by industry, fascism, spiritual ignorance, and senseless materialism. When Tolkien writes of Sauron (or the Nazgûl Witch King) as being a powerful, dreadful sorcerer opposed by the forces of light and life, he’s talking about operative forces in the 20th century. Now here we are. And Sauron has won. In Tolkien’s mythos, Sauron is not Morgoth, not the first or historically greatest expression of evil the world has ever seen. But, for the people of Middle Earth in the Third Age, he certainly is. When the One Ring is destroyed in Mount Doom, the physical incarnation of Sauron dies once and for all. He is reduced permanently to “a spirit of hatred borne on a dark wind” (The Letters of J.R.R. Tolkien, Letter 211). But he is not gone. The world we live in exists only analogically to that of myth and fantasy, and in our gray morally relative existence—where nothing is ever absolute or certain and concepts like loyalty, justice, and honor are regularly ground under the relentless tread of ambition, exploitation, and racism—the “spirit of hatred” finds many willing human hosts. It cannot die; it cannot be conclusively defeated. Just as Morgoth gives rise to Sauron’s many incarnations over time, so does the corrupt spirit of hatred and cynicism reemerge in every age of our world. Tolkien believed this when he wrote: “That Sauron was not himself destroyed in the anger of the One is not my fault: the problem of evil, and its apparent toleration, is a permanent one for all who concern themselves with our world” (Letter 211). It’s a war that every generation has to fight on some level. Our grandparents and great-grandparents fought the Nazis, who now offer us the most accessible comparison to Trump and his followers. But history is full of brutality, ignorance, xenophobia, and institutional violence. One need only do an internet search or open a book on world history. It’s all there. And, historically speaking, dark lords win more often than not. The knight fights the dragon, the Free Peoples of Middle Earth fight Sauron, until such time as the dragon eats the knight or Sauron regains the Ring. Then, for lack of an enemy, the dragon eats itself and Middle Earth dies covered in darkness. And only then will the world be reborn with new heroes and new dragons. This is the cycle of creation described in every apocalyptic world myth. And we are seeing the Twilight of the Gods now in the 21st century. And so I leave this message for my gentle and kind friends, many of whom follow spiritual paths of light, life, and love, practicing compassion and living in harmony with nature as best they can: from darkness, new light will come. But it is unlikely that you will live to see it. Rather, as Yeats wrote in “The Second Coming”: “Mere anarchy is loosed upon the world,/ The blood-dimmed tide is loosed, and everywhere/ The ceremony of innocence is drowned.” With the inauguration of Trump, the world enters its inevitable death process. This is a difficult thing for us to accept. We want to believe that a hero, Frodo maybe or some other embodiment of hope and sincerity, will save us from the end the way the Allies beat the Axis or the way Beowulf defeated Grendel. But the world has already passed the 400 PPM threshold with no signs of abating, indicating that catastrophic environmental, economic, and social repercussions forecasted by (very solid) climate science are inevitable. Through Trump, the spirit of hatred will rule, preventing the world from recovering. Resources will be put towards bread and circuses. Useless walls will be constructed. Discrimination will prevail. The EPA will be rendered powerless and the poor, sick, and otherwise vulnerable will die. New forms of economic and physical slavery will come into being through the instruments and systems provided by an unchecked corporate culture. Education will become further monetized and the arts and humanities will only be carried on by private individuals if at all. This is the end of the world as we have known it, but it has been coming for a long time. So what remains for magical people to do? Make peace with your gods. Stop trying to get that promotion or get revenge on your ex or get laid for the umpteenth time (or, for some of you, at all). Cultivate your soul. Meditate more. Work more on the Inner Planes. Forget a lasting legacy for yourself. No one is likely to care or remember you after everything is gone. Do you know the names of more Ancient Romans than you can count on your fingers? Yet the Roman Empire was vast and powerful. It fell, too. Do that and stand tall when the dragon comes.